Οι μοναχές του ορθόδοξου σέρβικου μοναστηριού Socolica, που βρίσκεται στην εθνικά διαιρεμένη και βασανισμένη περιοχή της Μιτροβίτσα, στο Κοσσυφοπέδιο, μαθαίνουν αλβανικά, για να μπορέσουν να επικοινωνήσουν πληρέστερα και βαθύτερα με τους πολλούς αλβανόφωνους μουσουλμάνους, που επισκέπτονται το μοναστήρι για να προσευχηθούν στην Παναγία. Οι μουσουλμάνοι της περιοχής προσεύχονται στην Παναγία ιδιαίτερα για τη θεραπεία κωφών παιδιών και την ευλογία άτεκνων ζευγαριών. Κέντρο της προσευχής τους είναι ένα γλυπτό που απεικονίζει τη Θεοτόκο, χρονολογούμενο στο 14ο αιώνα. Το μοναστήρι Socolica προσπάθησε πολύ να παραμείνει ουδέτερο κατά τις πολύ αιματηρές συγκρούσεις (που στοίχισαν και νεομάρτυρες) μεταξύ σερβικού στρατού και Αλβανών εθνικιστών τα έτη 1998-1999 και γενικά προσεγγίζουν την επαφή Σέρβων-Αλβανών πνευματικά, όχι πολιτικά ή "πατριωτικά" ("Νεκρός": πράγμα που με βρίσκει απόλυτα σύμφωνο). Έτσι, και οι μουσουλμάνοι ακόμη αναγνωρίζουν το υψηλό πνευματικό τους επίπεδο και τη μεγάλη προσφορά αγάπης προς όλους, ανεξάρτητα από την εθνικότητα ή τη θρησκεία τους. A Serb Orthodox monastery in religiously polarised Kosovo is breaking stereotypes by making its nuns learn Albanian so they can talk to Muslim villagers who come to pray at a statue of the Virgin Mary. Muslims from all over Kosovo flock to the Sokolica monastery because they believe its 14th-century sculpture of the Virgin with Christ can cure deaf-mute children and help childless couples fall pregnant. "When they ask how to pray, we tell them to pray in their own language and in the way they are taught to. We let them praise their Allah as we do our God" the 67-year-old head of the monastery, Mati Makarija, told AFP. The monastery is settled in rugged volcanic mountains that overlook the ethnically divided city of Mitrovica, where relations between Serb Orthodox Christians and Albanian Muslims are tense -- as they are throughout Kosovo which broke free from Serbia in 2008. Sokolica is surrounded by the Muslim village of Boletin whose residents are regular visitors. "Our door is open for them. If they think our sacred sculpture can help them, then they are welcome" said Makarija, dressed in a traditional black habit and with a black head scarf. As part of her effort to welcome all faiths, Makarija has instructed her nuns to learn Albanian, which is vastly different to Serbian and spoken by very few Serbs. "Speaking languages of each other is a must" Makarija said. "I don't want them to talk to the neighbours and Albanians who visit the monastery in English but in Albanian." "I am always looking for (Albanian) textbooks. I might be too old for it already but my nuns have to learn Albanian" insisted Makarija, who speaks English, German and Greek. The eight nuns have to squeeze their language lessons into an already tight schedule. 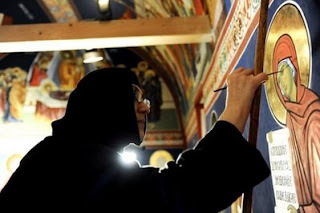 Under the supervision of Makarija, considered one of the best fresco painters in the Serbian Orthodox church, they work from the early morning, mostly in the fresco and icon workshop that produces paintings popular with foreign buyers. "That is our main income" Makarija said. The language training, which has aroused great interest among the Muslim villagers, is the latest measure in a long tradition at the monastery of reaching out to its Albanian neighbours. Even during the 1998-1999 Kosovo war that pitted the security forces of Serb strongman Slobodan Milosevic against ethnic Albanian guerrillas, the convent tried to remain neutral [Nekros: click here: New-Martyrs in Kosovo]. Today the nuns and villagers won't be drawn in to discussions about politics, a sensitive issue with Kosovo declaring independence in 2008 but its status fiercely disputed by Serbia. "Politicians are occupied with politics, not us", Makarija said. Villagers tell how she braved heavy fighting during the war to take a pregnant Boletin woman to the Serb-controlled hospital in Mitrovica to deliver her baby. "It was dangerous even for her, despite the fact that she was a nun", said Besim Boletini, who lives next door to the monastery. Muslim villager Mustafa Kelmendi, 67, said Makarija had saved his son Basri from Serb paramilitaries twice. "The war brought chaos ... However she did not allow Serb forces to stay in the convent even when fighting was going on in the area" the pensioner told AFP. Kelmendi is a regular visitor to the restored Sokolica monastery, built in the Middle Ages, decorated with neatly cut white stone tiles and considered one of the highlights of medieval orthodox architecture in Kosovo. The famous sculpture, known as the Sokolac Virgin, is adorned with gold necklaces, bracelets and strings of pearls from grateful visitors -- Christians and Muslims. "It cures not only their but also our people" Kelmendi said. Αναρτήθηκε από ΝΕΚΡΟΣ ΓΙΑ ΤΟΝ ΚΟΣΜΟ στις 4:00 μ.μ. Παρόμοιο πράγμα είδα στην Παναγία Σουμελά στον Πόντο, μουσουλμάνες να προσέρχονται στο μοναστήρι και να παίρνουν αγίασμα που τρέχει , απο έναν βράχο στο πάνω μέρος του μοναστηριού. Βέβαια κατά πόσο ήταν μουσουλμάνες εκείνες οι γυναίκες το ξέρει ο Θεός και η ψυχή τους..